On reading its inscription, one begins to understand why this is different to most of the other graves and memorials. 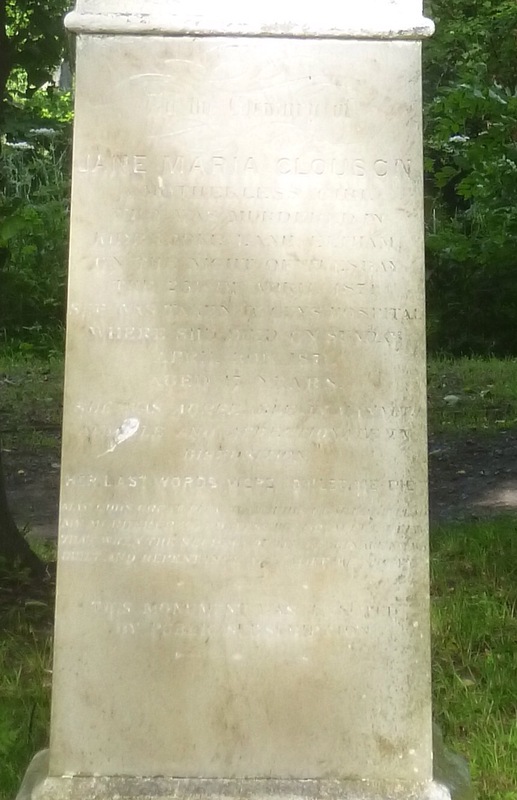 The ‘girl’ was Jane Maria Clouson and she had been found by a police officer, patrolling what is now Rochester Way, in the early hours of 25 April 1871, somewhere around what is now its junction with Brenley Gardens – as a witness at the subsequent trial noted that it was around 300 yards from a ‘rivulet’ (Lower Kid Brook). She had been severely beaten with a hammer and died of her injuries five days later in Guy’s Hospital. Jane Clouson was identified on 1 May by relatives and the police arrested Edmund Pook, the son of her former employer, the same day. She had been dismissed from the household at 3 London Street (now Greenwich High Road) – the Pooks suggested that this was because of her laziness and unkempt appearance; although Jane Clouson’s family suggested that this was because Edmund had got her pregnant and had no intention of marrying her. There were several hearings in relation to the case – the main one being at the Old Bailey where after 5 days of evidence, the jury took just 20 minutes to acquit Pook; two earlier hearings at Coroners and Police Courts, where Pook had offered little evidence, had found him guilty; and a libel case a month after the criminal case found in Pook’s favour. There is a very detailed summary of the evidence presented at the fantastic resource of the Old Bailey online. It is clear from there that the police and prosecution struggled to prove the case against Edmund Pook ‘beyond all reasonable doubt.’ The case still provokes extremely partisan interest, so I’ll summarise the case from each viewpoint. The case for the prosecution (presented by a relative of the Jane Clouson) was that a witness had seen someone looking like Pook around Kidbrooke Lane just before the time of the murder; a bloodied hammer had been found close to Morden College; Pook had been seen buying a hammer; blood was found on his clothes; Pook had been having affair with Jane Clouson, had made her pregnant and they were still seeing each other after her dismissal. The case for the defence (presented by a relative of the Pooks) was that Edmund Pook had been positively seen in Lewisham at around the time of the murder; that the specs of blood on his clothes related to him biting his tongue with epileptic fits; the police witnesses were unreliable; there was no positive identification of him having bought the hammer from the shop’s owners; no evidence was produced of anyone having seen them together and a locket which was suggested to have been given to Jane by Edmund was in fact a present from another former Pook employee named Humphries. There was a large amount of public interest in the case and the funeral on 8 May seems to have been a major local event. The road between the relative’s house in Deptford, where the cortege started from and the cemetery was lined with thousands of people, with police controlling the crowds. The pall bearers were all woman dressed in maids uniforms. The listed memorial was erected soon following a public subscription. While there appears to have been some hostility towards Pook after the verdict, however, this was not sufficient to prevent the family business continuing at the same address in the 1881 census. Edmund married Alice soon after and they remained in Greenwich – the business had moved to Church Street by the 1908 Kelly’s Directory. Edmund and Alice were living in St Peter Port in Guernsey when the census enumerators called in 1911; he was still working as a printer. 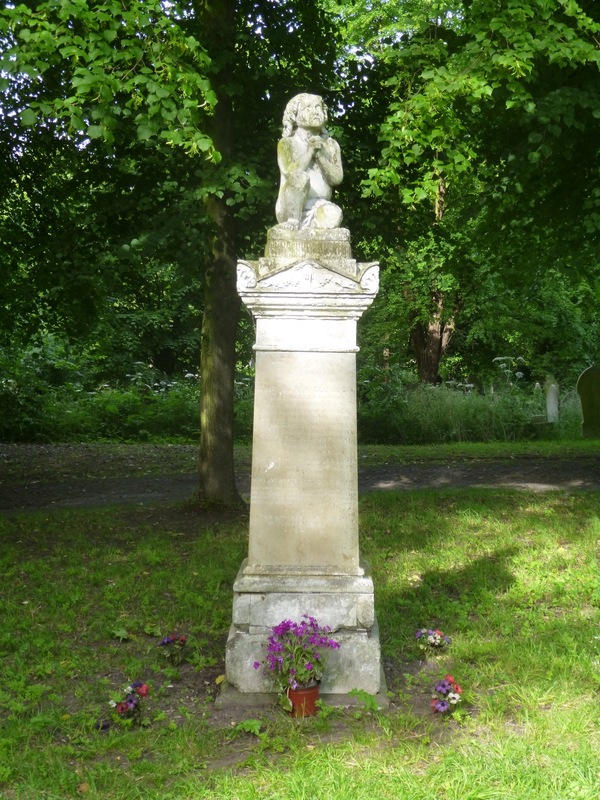 Alice died in the Channel Islands around 1916, Edmund returned to England and died in Croydon in 1920. The way in which the police pursued the case was criticised by both the judge and in the House of Commons at the time. However, they seemed uninterested in pursuing anyone else; in early 1888 the Australian police detained Michael Carroll who confessed to the murder. The Sydney Police offered to detain him but Scotland Yard Authorities did not want to even question him. Whoever the murderer was, Jane Clouson was the victim of a terrible, vicious attack and died far, far too young. 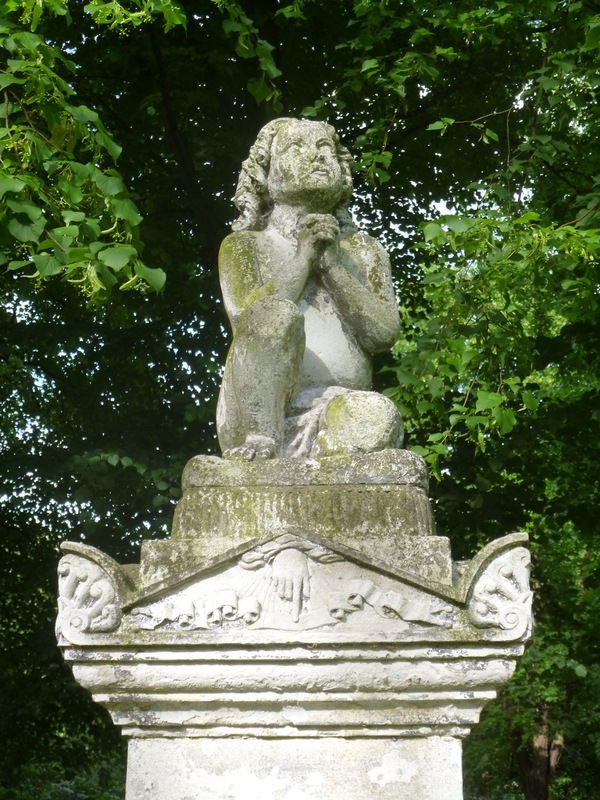 This entry was posted in Cemeteries, Greenwich History, Lewisham History, Listed Lewisham and tagged Brockley & Ladywell Cemetery, Edmund Pook, Eltham Murder, Jane Clousen on November 26, 2014 by Paul B. It is a desperately sad tale, both of the murder itself but the extent to which the police messed up the investigation. The extent to which it still polarises views is quite surprising.